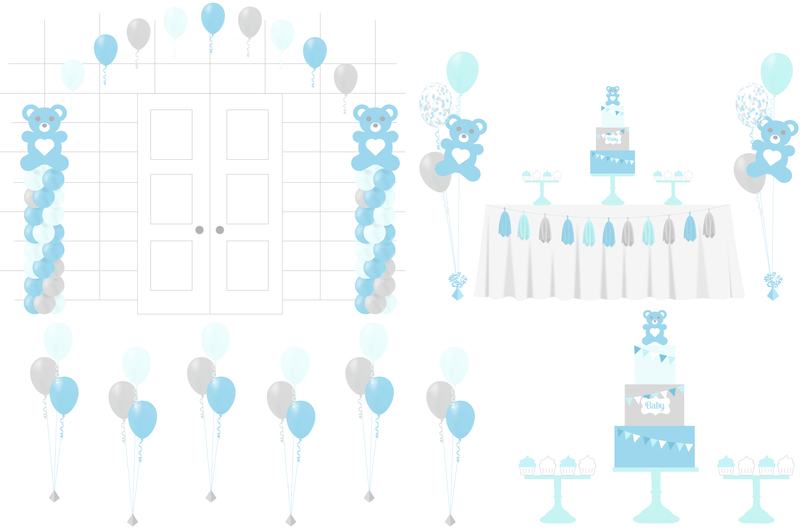 balloon package, cake, sweet tables, 50th, 18th, birthday party balloons. 5 tier cupcake tower filled with personalised cupcakes to match any colour scheme or theme. View our cupcake tower gallery. Cake table decorated with tablecloth, runner and personalised name superhero bunting banner. 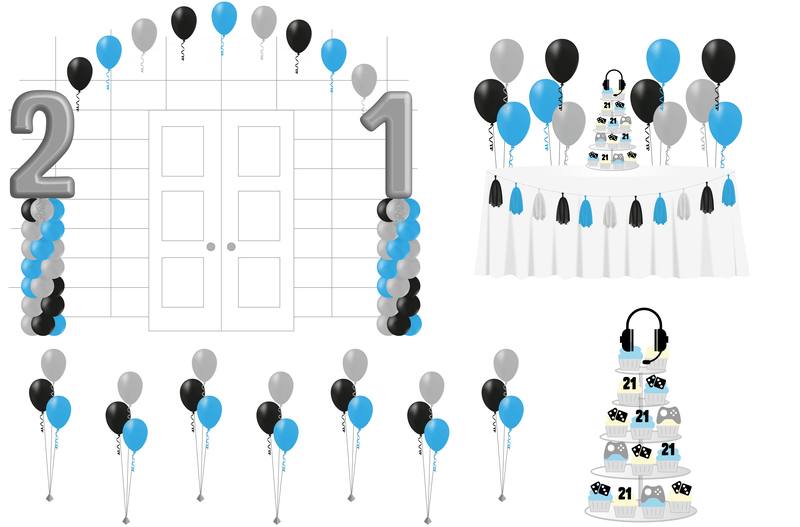 X1 Large balloon arch in superhero party colours and comic book decorations. X6 Table top balloon bouquets in superhero party colours. 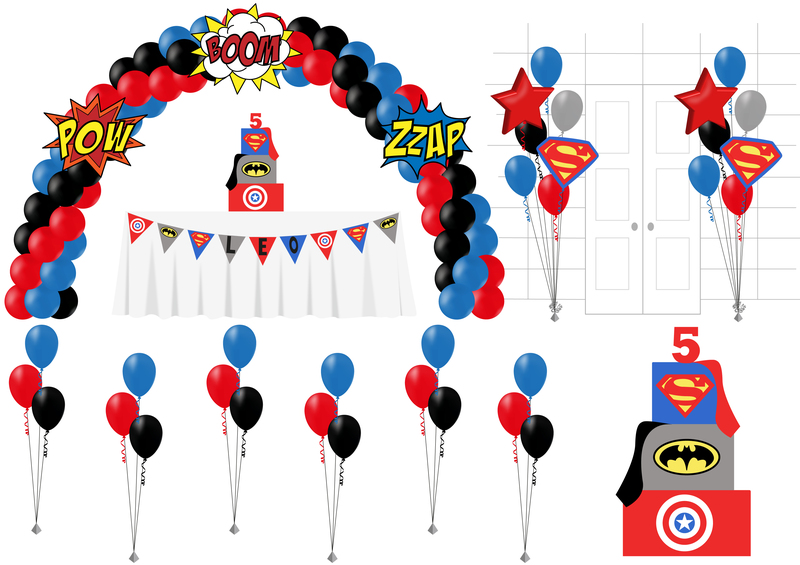 For additional superhero party balloon bouquets see our balloon chart for more information. 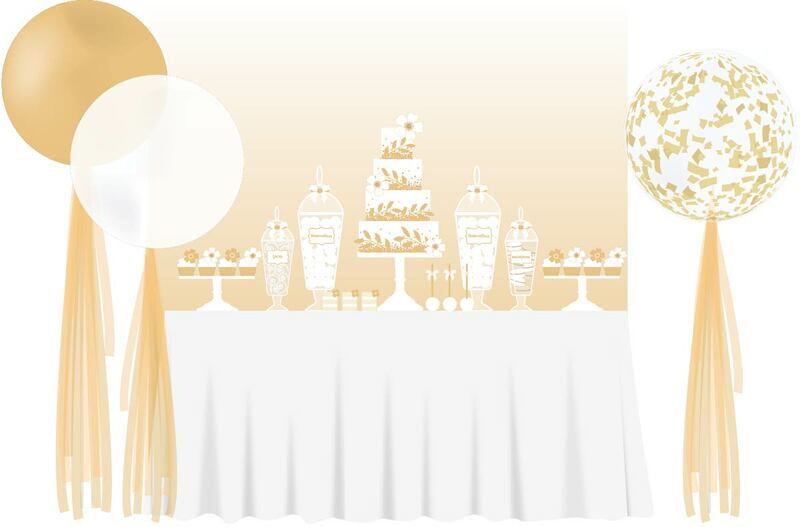 Turn your super hero cake table into a show stopping candy buffet with jars and platters of sweets and treats in a beautifully detailed display. View our candy buffet gallery for inspiration. X1 Large balloon arch in superhero colours and comic book decorations. X6 Table top balloon bouquets in super hero colours. 3 Tier Princess castle cake to your own bespoke design, personalised with name and age etc. See our celebration cakes. Cake table decorated with tablecloth, runner and cake stands. Single connecting princess balloons arch. 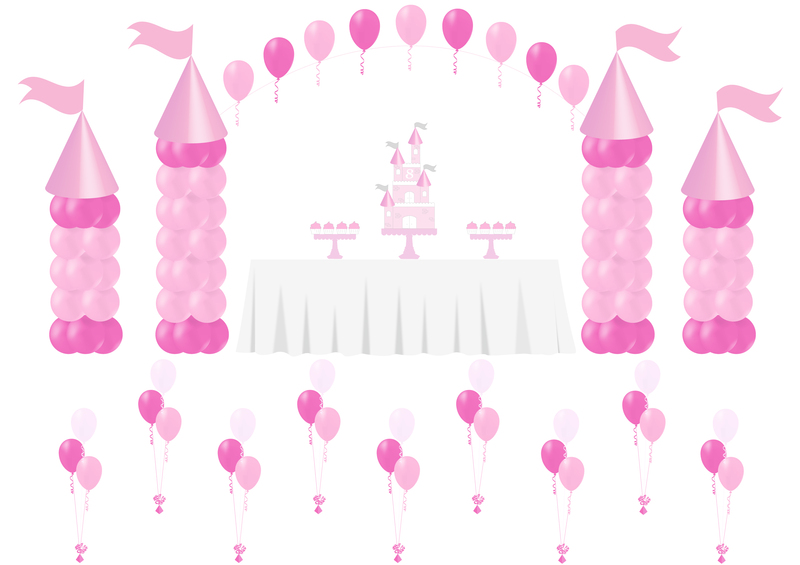 Additional princess balloons & bouquets available, see our balloon chart for more information. 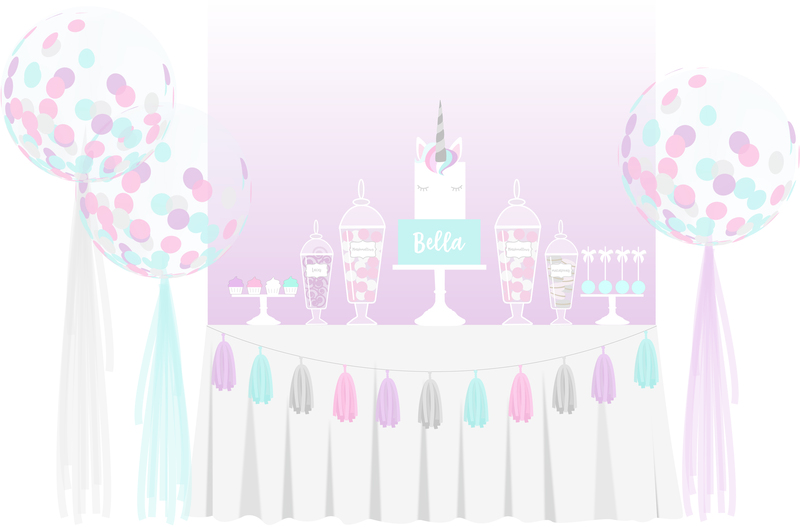 Add the wow factor to your princess party, by transforming your cake table into a princess candy buffet! With jars and platters of sweets and treats in a stunning display. View our candy buffet gallery for inspiration. 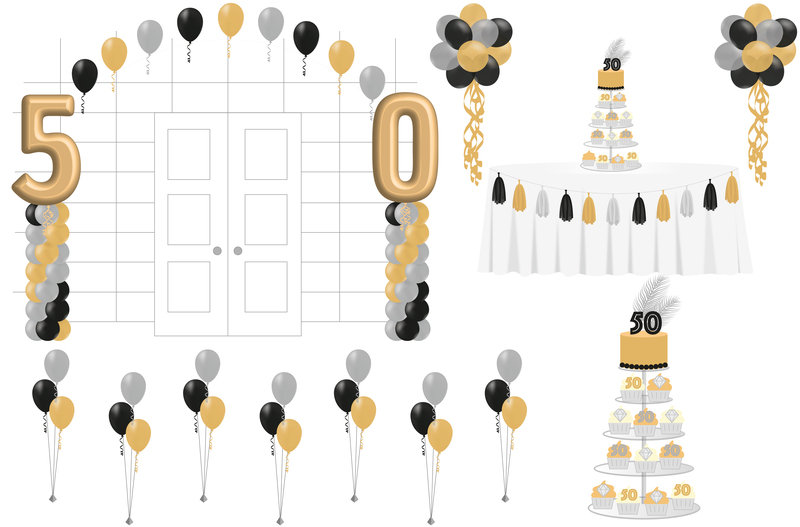 x2 Large number 50 balloon columns with connecting helium balloon arch. 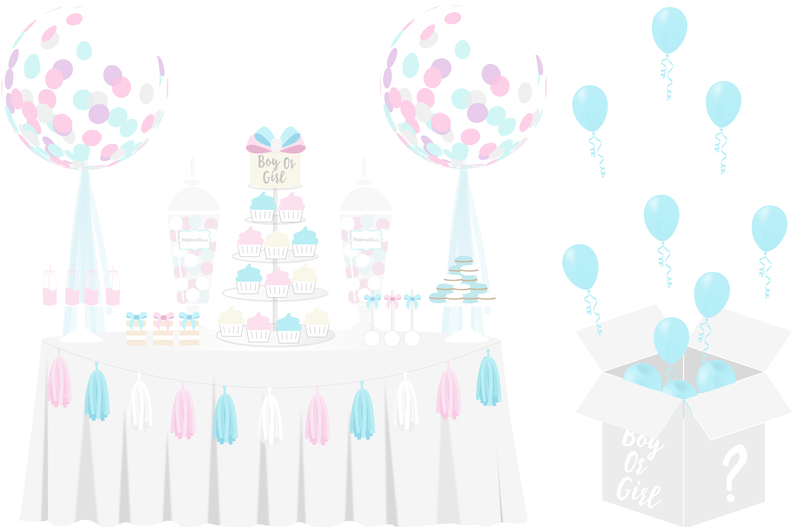 X2 Balloon pompoms clouds perfect for either side of your cake table. X7 Tabletop balloon bouquets in matching colours. 50th cake table decorated with tablecloth, hand made garland/bunting and table runner. Thank your guests with our handmade favours. From cupcakes to french macarons we personalise your treats to create unique gifts. Our twinkling LED balloons create a great party atmosphere, for just £1 per balloon. Light up the dancefloor! See our balloon price chart. 2 Tier cake to your chosen bespoke design personalised to match your theme/age name. See our celebration cake gallery. X2 Stands of personalised bespoke cupcakes and cake pops. View our cupcake gallery for inspiration. 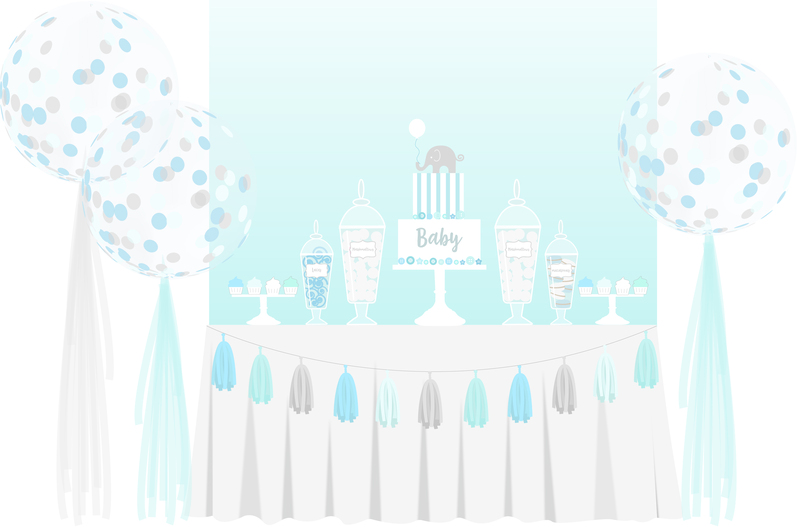 Antonia’s Candy buffets are decorated with personalised sweet labels, ribbon detail and come with sweet scoops and treat bags. 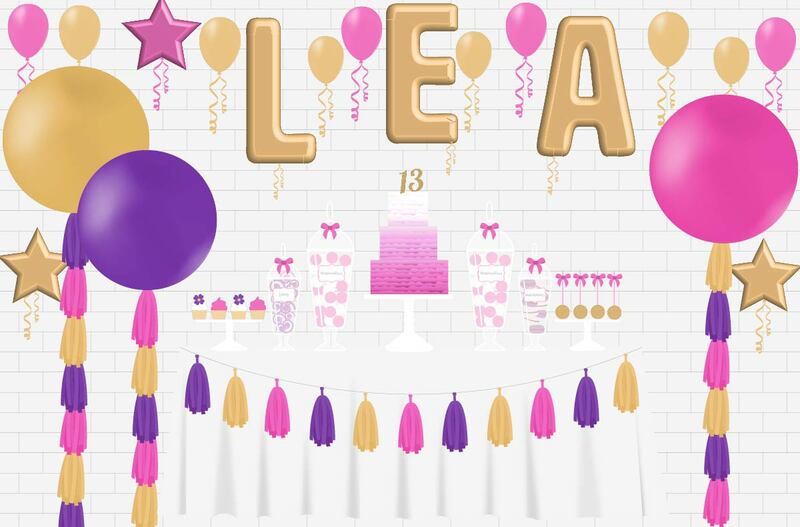 Upgrade your balloon package and add sparkle to your ceiling with light up led balloons. Wow your guests with a magical twinkling effect. See our balloon chart. Cake table (six foot) dressed with tablecloth and runner coordinating with your event. 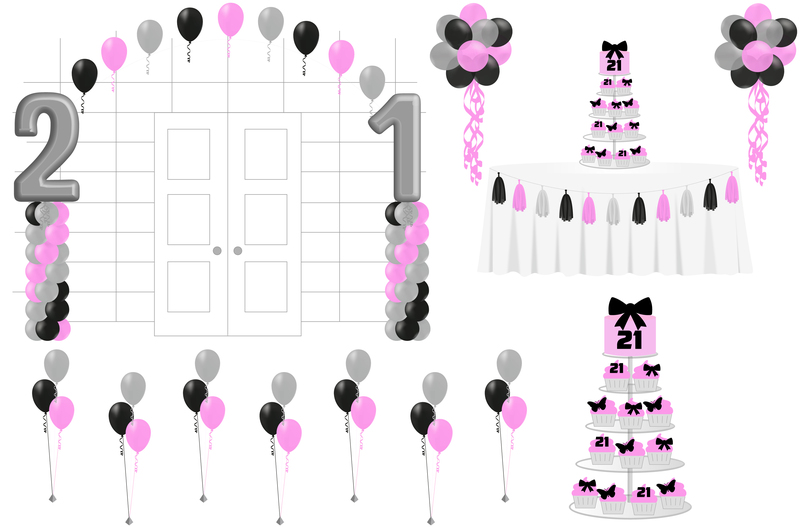 X2 Custom design round giant balloons with tassel or foliage tail. Four tier wedding cake to your own bespoke design. View some of our recent wedding cakes in our gallery. With your choice of flavours and fillings from our delicious wedding cake menu. Cake stands filled with personalised cupcakes and cake pops. See our cupcake gallery for inspiration. Elegantly plated decorated biscuits, personalised chocolates and sweet treats. Check out our candy buffet gallery. Large & medium decorative glass bonbon jars filled with sweets and treats coordinating with your colour scheme. 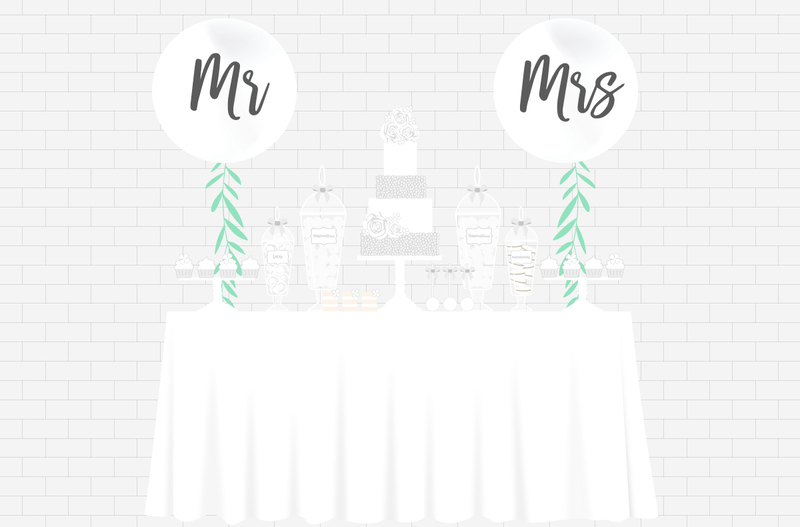 All Antonia’s candy buffets/sweet tables are decorated with personalised sweet labels, ribbon detail and come with sweet scoops and treat bags. Our popular favours are handmade and can be tailored to match your wedding. We can take elements off your wedding cake/candy buffet and create unique treats for your guests to enjoy. Our giant round balloons make the perfect photoshoot prop, backdrop, or alternative table centres. They can be customised and filled with confetti, feathers and finished with handmade tassel garlands, foliage and even fresh flowers. 3 Tier Minnie Mouse cake to your chosen bespoke design, personalised with name and age. See our celebration cake gallery. x2 Stands of Minnie Mouse cupcakes personalised with age/name. View our cupcake gallery. X2 Entrance way balloon bouquets with foil and latex character balloons. 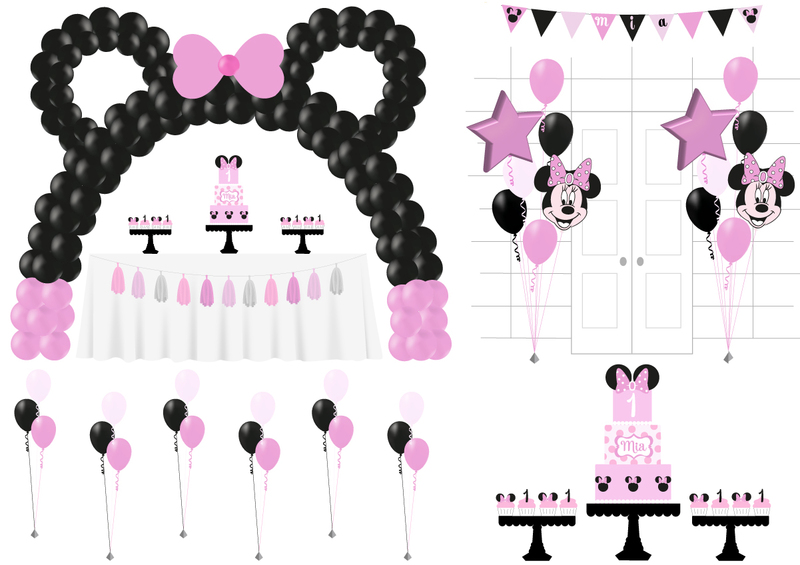 X1 Personalised Minnie Mouse Birthday bunting with your name and age. For additional Minnie Mouse balloons & bouquets see our balloon chart for our price list. Turn your Minnie Mouse cake table into a show stopping candy buffet sweet table. With jars and platters of sweets and treats in a beautifully detailed, personalised display. For examples see our candy buffet gallery. A custom made three tier TMNT, your own unique design. Check out our celebration cake gallery. Cake table decorated with tablecloth, runner and hand made tissue paper tassel garland in TMNT colours. X4 Large TMNT balloon pillar characters. 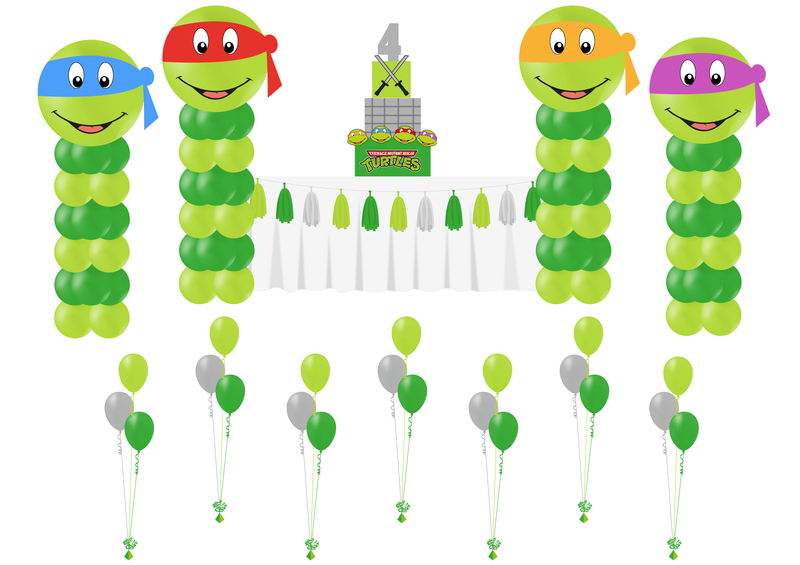 To add extras to your TMNT balloon package please see our balloon chart for more info.